Do you need Termite Removal in Portland? When it comes to professional termite removal in Portland from a licensed pest control service, it helps to know what you’re facing. Termites are responsible for billions of dollars worth of property damage every year. The longer you wait to have Family Home Pest Control perform a termite inspection, the greater the damage. That occurs for several reasons. Termites don’t have a traditional sleep/wake cycle. They work 24-hours a day. What are they working on? Expanding their colony. That’s fine in the middle of the forest, but when that colony is in your home and their food source is your support structure, you need to act fast. What termite species is infesting my home? In the Pacific Northwest, there are two different types of termites that are predominant. Damp wood termites need an environment that is very moist. Thus the name “damp wood”. They are not usually found in homes that much because the wood in most structures is usually dry. If there ends up being some sort of a moisture leak from rain or a bad roof, then it is possible to get a damp wood termite infestation in those walls. More often, damp wood termites are found in logs that are laying in the wet environment, out in the rain. Quite often during the summer, you will see bugs flying during the day or in the evening. They will have relatively large wings and fly somewhat slowly. They are actually female winged reproductive termites of the Damp-wood species. They’re looking for a place to start a new nest and quite often do get up under the lip of the bottom of the siding and into your walls. Dampwood termites are much larger than subterranean termites. They do not have workers. Termites have large mandibles and large heads. They consume wood across the grain. The average length of these termites is 20mm non-winged, and 25mm winged. Subterranean termites are the ones that you should be more concerned about. Their nests are down underground and cannot be seen. They come up out of the ground and build small mud tunnels to stay inside of when they come up to eat your house. Usually, termite treatments are very specific depending on where they are found in the structure. Because they are out of sight, a subterranean colony can continue expanding without a homeowners knowledge. Some colonies can span the size of a football field and infest multiple homes at one time. That makes protective steps so important. As the most common termite type in the United States, these are responsible for the most damage. You can test wood by poking it with a screwdriver. Listen for a hollow sound. Subterranean termites are small. They only eat softwood and eat around hardwood. Workers and soldiers are cream colored. Soldiers have dark heads. Swarmers are black or brown. Workers and soldiers are typically 6mm in length. 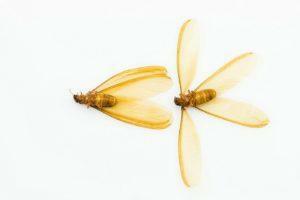 Winged termites can be 6-12mm long. How much damage are you willing to accept? There are no at-home remedies for an infestation. Don’t wait another day. Call us now. How do I know if I have termites or ants? 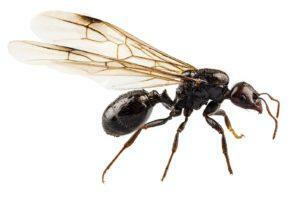 Homeowners often confuse flying ants with termites. These look and behave very differently. Notices the differences in the body shape and wing structure. Front wings longer than back wings. Bent front antennae roughly 90° angle. Front and back wings are equal length. 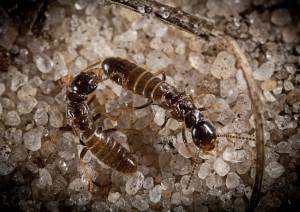 There are a whole variety of treatments for subterranean termites. You can go to all lengths with respect to making sure that you don’t have them or don’t get them in the future. Some people do preventative maintenance treatments on a regular basis. There are times where that would be warranted. Our termite removal specialists will work with you to identify the best action plan for your property. This is the most commonly used treatment method for termites. Our commercial termite removal methods are EPA approved, and application is everything. That’s why many termite treatments can only be applied by certified pest control technicians. Some of the more common varieties we use include treating dry wood against future infestations, baiting termites, and applying liquid treatments directly into your soil. Barrier treatments must be applied by an expert. This should never be performed by a homeowner because contamination of the soil and even groundwater can occur if it is done incorrectly. These soil-applied barriers are a great way to prevent intrusive infestations after your current infestation has been dealt with. These are almost always integrated into the construction process. Materials like sand and steel mesh provide an effective barrier against termites. Making sure all cracks in a foundation and even the smallest entry points are sealed can be effective as well. In some instances, we have treatments that will last for many years. Usually, there has to be a specific type of application of material on the dry wood where it does not, or never will get wet. This material penetrates the wood and crystallizes there and is active for many years. However, if the wood gets wet then the product will leach out of the wood and become useless as a preventative. There are other treatments that can be used which include trenching around the foundation both in the crawlspace and outside of the house on the ground. We can also use subsoil injection or, sub-slab injection where necessary. Sometimes the walls need to be injected as well. There are a lot of facets of treatment types for different types of termites. Each and every situation regarding termites needs to be analyzed individually and treated in a specific way. Always consult a pest-control expert like one of ours, that has been in the business for many years. How I can I prevent a termite infestation? Remove dead logs and branch piles from around your property. Do not store firewood near your home. If you find a leak, fix it. Water damaged wood is an open invitation for termites. Don’t let trees or shrubs grow directly against your home. Take care of openings into the home. Fill cement and foundational cracks with grout, caulk, or cement. Make sure water drainage is effective. Do not allow soil around your foundation to remain wet for extended periods of time. Contact us today for termite treatment and removal in Portland Oregon! 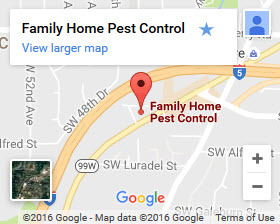 For professional termite removal in Portland, Call (503) 452-9965 or Contact Family Home Pest Control today. We’ll fully inspect your property, identify the extent of the infestation and species, and create a customized treatment plan designed specifically for you. Get personalized termite removal. Call us now for scheduling!